The last several issues have given us close-ups of characters' desks, a peek into their minds and personalities. This issue we get Jimmy's 'desk'. He isn't someone who sits too often. He is a man of action. So he needs something portable. So we see his camera bag. But even this shows what is important to Jimmy. One apple. One electronic device, his tablet, with some messages (one from editor Jess Chen!). And a whole lot of camera stuff. Compare this to the disorganized, overly busy, cluttered spaces we have seen before this. It shows just how focused Jimmy is. He is a photographer first and foremost. We start with Jimmy out with a young woman, most likely the 'EllaLovesSnakes' girl from his tablet. She speaks about a life altering experience she has had, something she wants to share with Jimmy. She is quite forward with her passions, kissing him and promising him pleasures, that it will be worth it if he also goes in with an open mind. And then we see that she has taken him to a Kobra cult rally. Too fantastic. Jimmy's eyeroll and soft curse is perfect. But what really works for me is the semi-crazed, wide-eyed look on the woman as she sees the acolytes before her. She is definitely bought in. She's drinking it all in with her eyes. Great work by Epting. You wonder if she truly was that attracted to Jimmy. Or were her feminine wiles being used to seduce him, literally, into the cult. It all changes when Jimmy starts snapping pictures. The bloom is off the rose. She isn't that into him any more. She calls on the troops to descend on Jimmy. I love his rather flippant response as he tries to squirm free. He is lucky he slipped out when he did because a big ball of light blue energy seems to explode and then implode at the scene. Again, not worrying about himself and thinking only of the news, Jimmy remains ever the journalist, snapping pics the whole time. When the dust settles, Jimmy sees the building is basically gone. Just like that, this cell of Kobra is gone.That's why I think this implodes rather than explodes. There's not a lot of wreckage, more like a hole. These days I can't help but look at light blue energy and think of Dr. Manhattan. Is Leviathan tied to the Doomsday Clock event? The next day, Perry wakes Jimmy up from the editor's office couch. I love this sort of prickly and yet loving relationship between the two. Perry asks for Jimmy's press pass before relenting. But he does tell Jimmy to buzz off. I love the casual name drop of Jimmy bringing the Parasite into the Planet. That must have been quite a story! Then Jimmy, all garbed up in his usual 70s clothes, keeps what he learned and what he saw to himself. He doesn't want to tell even Perry what he saw ... not without knowing who owns the Planet. He isn't sure what they would do with the information. He can't trust the Planet. That's pretty savvy. Too bad Clark doesn't pry it out of him. 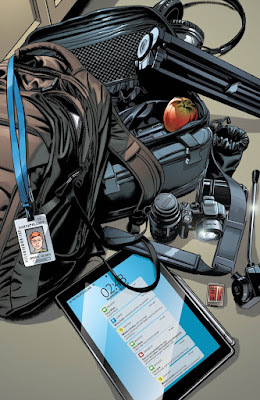 But duty calls Clark away ... again. 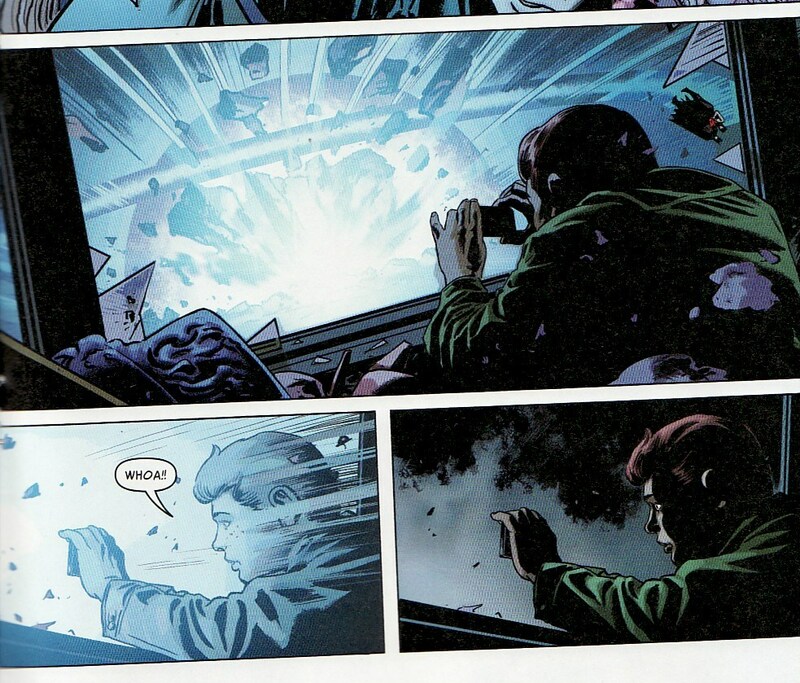 I wonder if this recurring bit of Jimmy about to tell Clark a secret (like his sleeping with Talia Al Ghul) but Clark slipping away is going to continue. 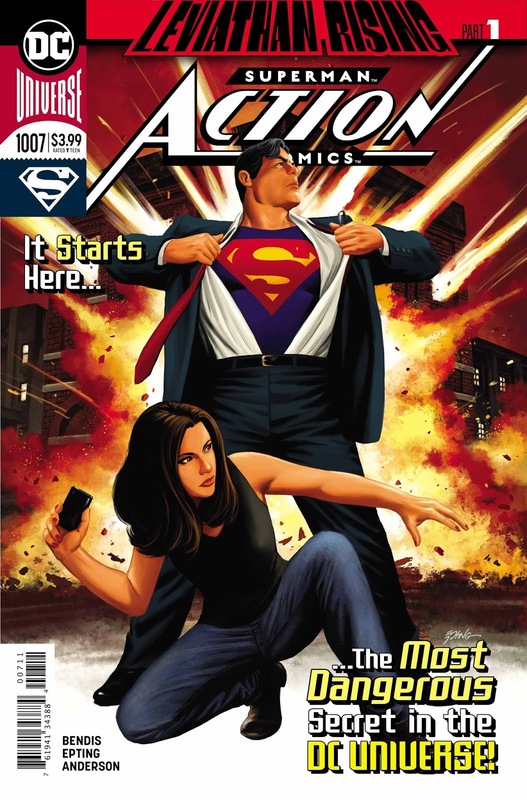 The book switches gears to Lois secretly meeting her father. After a virtual 'cone of silence' is instituted, Lois begins to bare her soul. She admits that a great man has fallen in love with her ... Superman. I love the determination of Lois' face in that last panel. She then tries to win over her father. A lot has happened between her and Jon. She wants to redefine her relationship with her dad. But what a weird way to deliver that message. Does Lois know how risky this is. 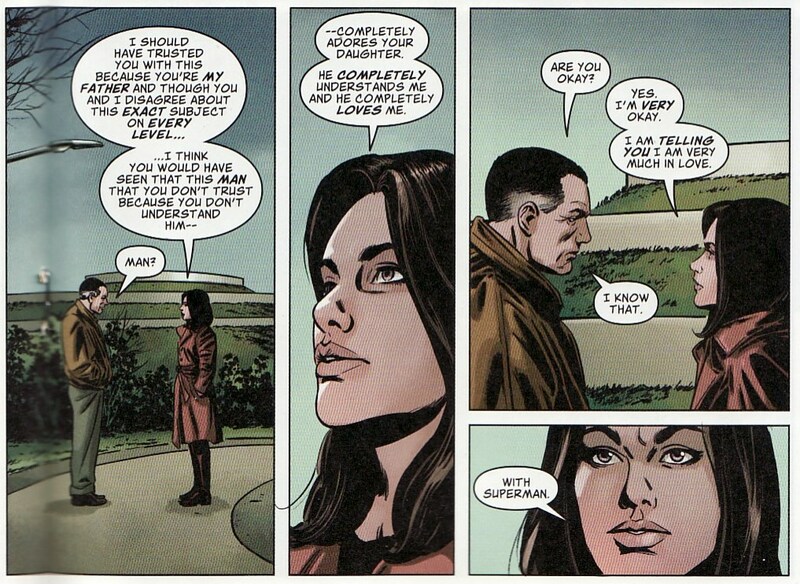 She is basically telling her xenophobic father that Clark is Superman. That seems like a big risk. Maybe not as big as sending her tween son away into deep space with a madman. But pretty close. This is not a Lois showing a ton of common sense. She has jeopardized her son. Now she has jeopardized her husband ... I mean 'husband with benefits'. Maybe this isn't the real Lois? She certainly doesn't sound like the Lois I know. Maybe this is someone trying to antagonize things. I get that she says she has been through a lot and wants to mend fences. But this seems off. 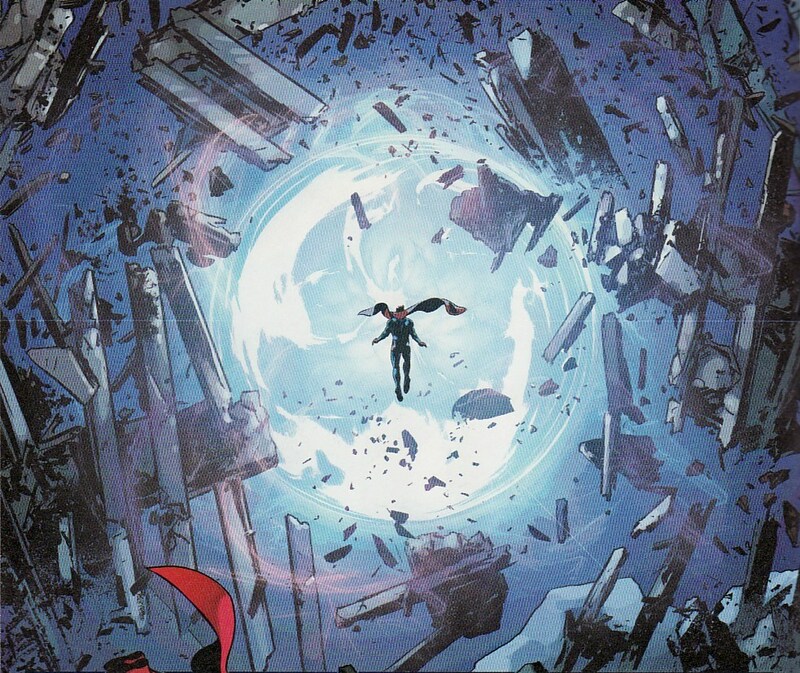 The other way this could unfold is that this is the real Lois and that General Lane dies again at the hands of Leviathan, taking this knowledge with him. 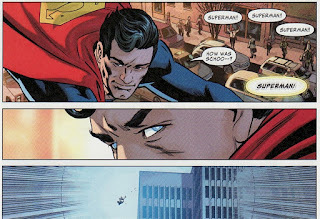 Unaware of this Lois meeting (how close is he keeping tabs on his estranged wife anyways), Superman flies around Atlanta. 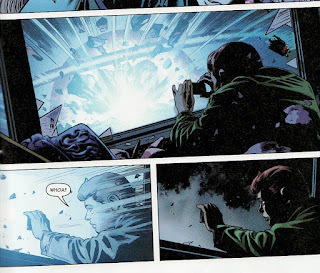 We have seen in other issues how Superman's super hearing work. How he filters all the nonsense and meaningless speech until he hones in on key words. Here we see how he might hear a lot of people saying 'Superman' but it is only when it is said with a certain emphasis that it bubbles up to him and leads to action. 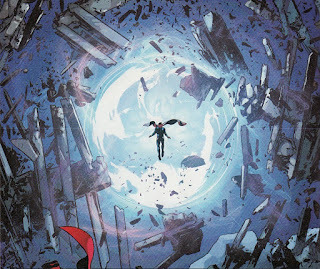 Amanda Waller is plummeting to her death! Superman rescues her and places her on the ground but she quickly disappears. And the headquarters of Task Force X? It disappears in the same implosive, light blue energy pulse. Someone is taking out shadowy organizations one by one. 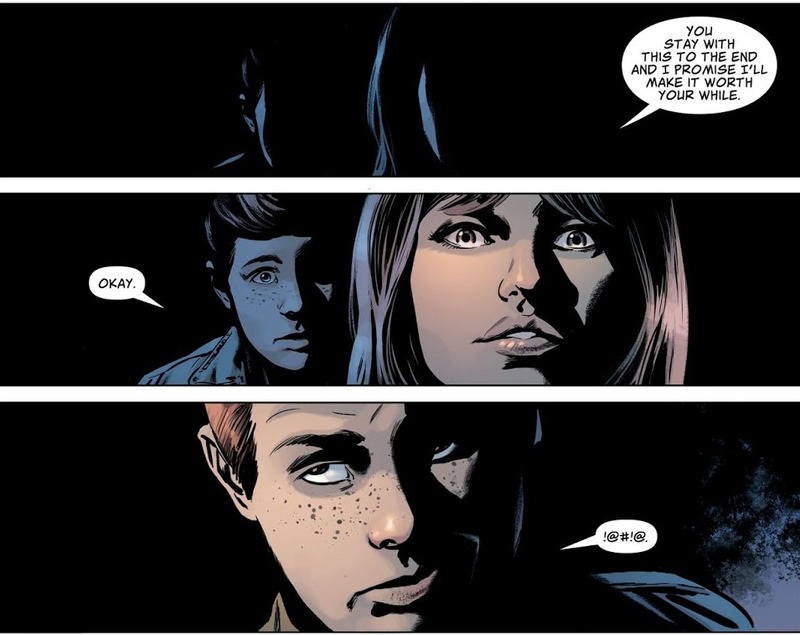 I thought this was a very good start to the Leviathan arc and great characterization of Jimmy. Steve Epting brings some solid, clean art. But that Lois scene sticks out a bit like a sore thumb. Still, Leviathan seems like a good, big threat. Can't wait to see where this goes. Great art, good Jimmy scenes... but Lois sounds real, REAL off. I hope we have a good explanation. Soon. 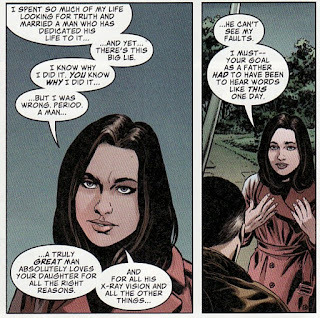 I doubt it - Bendis made his feelings on Lois clear with his proxy of her in the Marvel universe. It's one of several reasons (the tiresome new villain & the Mr. Oz nonsense, among other stuff) that I can't support his Super book run and can't wait till he leaves. He's causing irreparable damage to Lois as a character & DC is okay with it. But then again, look at how she was "featured" in the Walmart comic & respond like it's perfectly normal. 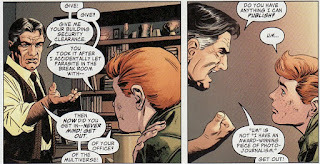 I thought the Lois scene was pretty good, I find the prospect of a deeper relationship with her father interesting. He was a little less one-note last time we saw him; perhaps knowledge of Clark’s other ID will make him less the hawkish zealot. The art was great. The cover, the interior. The Lois deal? Getting tiresome. Why was she estranged from Clark? Is she still? There's no reason that we don't have any answers, except that Bendis never wrote a scene where they talk about it. I'll ask again, why did she call Jon "Boy" when they were re-united? Why is the only story Jon told them so far, a story Lois already lived through and would have told Clark about already (last issue)? And - did she discuss with Clark that she was going to give his secret away to her father? Don't we think that might have been the right thing to do? She says she really loves him - odd way to show it. Lane storms off - he really doesn't take it well. He leaves Lois in tears. Great move, Lois! I hope Bendis has a plan to make sense of Lois. Or maybe he thinks she already makes perfect sense in his re-imagined version of her. I think something must have happened to her on the way back from space. Maybe she encountered Brainiac on her way home and is now his telepathic slave (as in Superman: Doomed from 2014). I continue to hope all of the strange, weird, bizarre out-of-character behaviors and unexplained story moments will eventually come together in an amazing “ah-ha!” reveal that makes this all worth it. Because I’m starting to lose faith this is going anywhere that I can hand wave my way out of. "She is basically telling her xenophobic father that Clark is Superman."